Updated 3/2017-- all links removed (except to my own posts) removed as many no longer active. 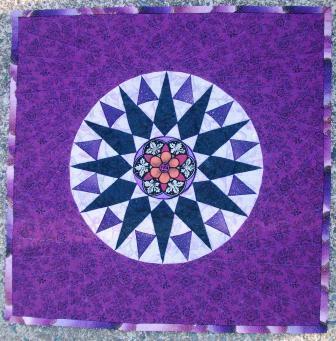 This is my quilt for the ALQS6. While trying to decide what to make for this one, I found the center motif tucked away inside Barbara Brackman’s Encyclopedia Of Pieced Quilt Patterns I was thumbing through for inspiration. I found it. I decided to draft a mariner’s compass to fit so my fabric motif could be used (whole) as the center. I found purples and black fabric in my stash to use. To ensure nice points I decided to hand piece this one. It is 18 in square. The center motif area is hand quilted along the black lines. 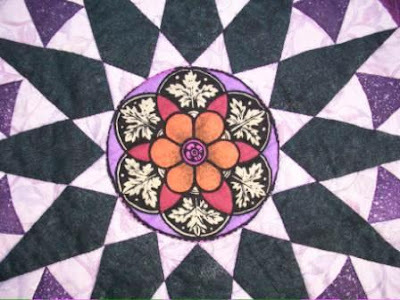 The compass and background is machine quilted. From the back you can see the quilting. A study on this topic was presented at the recent American Society of Plastic Surgeons (ASPS) annual conference in Denver. The article is also in the October issue of the Plastic and Reconstructive Surgery journal (reference #2 below). The article notes that more than 220,000 bariatric procedures are done annually in the United States. This number (IMHO) is likely to increase as these procedures have become an major tool in the treatment of obesity which now affects a third of adults in this country. Massive weight loss, regardless of whether by bariatric procedure or by diet/exercise, will often leave the individual with excess skin. This excess skin can be both a cosmetic and functional issue for the individual. Their study consisted of a survey mailed to 1,158 patients who underwent bariatric surgery between 2003 and 2011. Two hundred eighty-four patients responded (24.5%). Of the responders, 97.2% had their bariatric procedure covered by insurance. Only 72 of the responders (25.4%) reported having discussed body contouring surgery with their bariatric surgeon. Only 40 (14.1%) were referred for a plastic surgery consultation. Only 33 (11.6%) actually had body contouring procedures done at the time of the survey. The article does not mention what percentage of these procedures were covered by insurance verse considered self-pay. I have found it infrequent that insurance will actually pay for removal of excess skin resulting from massive weight loss after a bariatric procedure. It is a battle to prove the health issues (rashes, skin infections, mobility/comfort issues depending on where the excess skin is located, etc). The article does note that the most frequent reasons cited for not undergoing body contouring surgery were expense (29.2%) and lack of awareness (23.6%). Body contouring after massive weight loss is a mixture of cosmetic and non-cosmetic. Sometimes it is clearly one or the other, more often it is a combination. Spector states (in the press release), "Many massive weight loss patients suffer large amounts of loose, sagging skin as a result of their rapid weight loss that, if not removed, can cause rashes, wounds, infection, and limit comfortable mobility. It is apparent that insufficient counseling at the time of bariatric surgery is obscuring viable body contouring options for these patients." Yes, counseling is important, but if the individual can not afford it and insurance doesn’t cover it then the percentage of patients having the body contouring procedures isn’t likely to change. When Wanda Skyes, 47, had a bilateral breast reduction in February, the pathology returned with DCIS present in the left breast specimen. Recently the comedian appeared on "The Ellen DeGeneres Show" and during the interview revealed her breast cancer diagnosis and her decision to have a double mastectomy. Sykes continued, "It wasn't until after the reduction that in the lab work, the pathology, that they found that I had DCIS [ductal carcinoma in situ] in my left breast. I was very, very lucky because DCIS is basically stage-zero cancer. So I was very lucky." But, she added, "Cancer is still cancer. I had the choice of, 'You can go back every three months and get it checked. Have a mammogram, MRI every three months just to see what it's doing.' But, I'm not good at keeping on top of stuff. I'm sure I'm overdue for an oil change and a teeth cleaning already." Because she has a history of breast cancer on her mother's side of the family, Sykes explained she opted to have a bilateral mastectomy. "I had both breasts removed, because now I have zero chance of having breast cancer," she said. "It sounds scary up front, but what do you want? Do you want to wait and not be as fortunate when it comes back and it's too late?" The American Cancer Society has a nice article which reviews the risk factors for breast cancer. The risks factors for Sykes (which can be garnered from the news article) include a family history of breast cancer (don’t know which relative on mother’s side), a personal history of breast cancer, African-American, and age. I don’t think I would have advised her to have a bilateral prophylactic mastectomy on this information, but perhaps with more info I would have. Though an effort is made to remove all breast tissue with a prophylactic mastectomy, it is wrong for us doctors/surgeons to ever suggest that we actually DO get it all. More truthful to say we have removed most (90% plus). While we are on the topic of breast cancer, please, take a look at Elaine Schattner, M.D., Medical Lessons, post from Monday: NEJM Publishes New Review on Breast Cancer Screening. Updated 3/2017-- photos and all links removed (except to my own posts) removed as many no longer active. ZDoggMD is the host for this week’s Grand Rounds. You can read this week’s Funny Medical Stuff edition here. We are in orbit around a remote County emergency department. My crew of young interns is greener than a vat of Vulcan hemoglobin, and being of the Millennial generation they insist on bringing their stuffed Tribbles to work with them. …..
n the midst of this galactic chaos, Starfleet Command has asked us to host the 8th anniversary edition of medical bloggers’ Grand Rounds. So the great medical bloggers from around the galaxy have kindly contributed their bits and bytes, included below with my own two cents thrown in. Thanks to longtime Borg plastic surgeon Dr. Ramona Bates for hosting the last Grand Rounds; the next will be hosted by those crazy Klingons over at The Healthcare Economist on October 11th, so make sure to boldly go where no…awwww, never mind. And Now: Grand Rounds Vol. 8 No. 1 …………. Announcing the second annual Poetry Contest! An award will be given to the writer who submits for consideration the most outstanding poem within the realm of health, science, or medicine. ………. The contest began Wednesday August 31st and ends September 31st, 2011. The winners will be chosen shortly thereafter by an elite group of 8 judges (other doctors, friends with literary training, and select bloggers). The contest is open to everyone. My stomach lurched when I saw him. He was leaning against a brick building, his fingertips gripping the walls as if they alone were holding him upright. His head swiveled back and forth in animated conversation. He looked exactly the same as he did before I left Seattle for New York: Matted hair, unwashed skin, lopsided smile. ……….For some reason, this insect lifecycle (of quiet incubation, then, a torrent of energetic, soaring, in-your-face life!, then death, and repeat) reminded me of my own two-week chemo cycle. As I'll explain now, starting with the "death" phase, and moving toward the "hatch". …………. Then, repeat. Death, egg sacs. Hatching. Glorious flight. …………..
H/T to @precordialthump for the link to the NY Times Think Like a Doctor: Hiccups Solved! On Monday I challenged Well readers to figure out a medical mystery involving a middle-aged man with persistent hiccups…….. The correct diagnosis is …pulmonary embolus. The first two correct answers came within seconds of each other. And so, although we usually assign only one winner, in this case there will be two. I asked one of the winners, Dr. Mark Lowell, an emergency room physician in Ann Arbor, Mich., how he figured out the case, and he laughed. 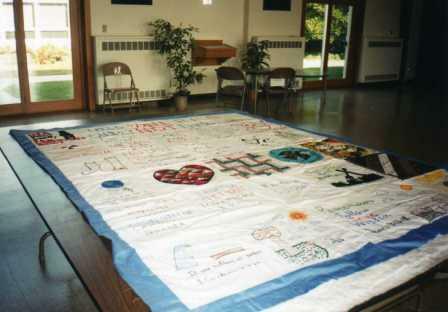 ………..The Quilt pictured above comes with no further details in the press handout - but I personally think it is one of those quilts you need to see before you die - it is magnificent. ● limiting the focus to solid organ transplants and vessel conduits recovered for organ transplant purposes. I am a strong proponent of organ donation, but anything we can do to improve the safety for all involved is a good thing to me. As I clean out my office I am finding photos of quilts and quilt blocks I thought I had failed to document. Here is one from 2002 when I contributed a block to a project to ban landmines. 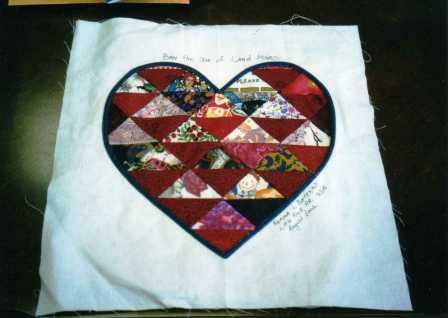 My block is a simple machine pieced heart which was then machine appliqued to the white fabric square. I wrote “band the use of land mines” across the top and signed it. 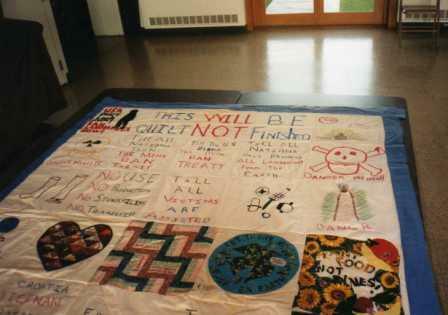 Patty (the quilt organizer) sent these additional photos to me in the winter of 2002. You can see my block in the middle area. I’ve created several tasks lists in Outlook to help me keep track of things that have to be done as I close my office. Many have been completed, but a large one looms. It’s the one that has to do with finding someone to sublease the office space. I thought I had it done, but the potential lessee backed out. I’ve countered with an option where I would continue to pay a percentage, in effect giving them a discount, but have not heard anything back from them. I am not a good negotiator or haggler. My husband is much better (at least at garage sales, etc). I am thinking I may have to hire an agency with contacts and a bigger net. It’s a nice space (1318 sq ft) – large enough for one or two doctors to share. Basic utilities (electricity, water) are included as are basic cleaning services. Maintenance has always been timely and the guys are very nice. So if anyone knows anyone who is looking for medical office space in Little Rock, Arkansas. I have some space here in the Doctors Building I would love to show them. Going through a stack of journals that have piled up, I noticed a nice little article (full reference below) discussing reconstruction of the burned hand. It’s a short, seven page article full of information. Early treatment and aggressive management are critical to restoring optimal hand function following burn injury. It has been shown that an early, multidisciplinary approach to the care of the burned hand has led to a successful outcome in 97 percent of patients with superficial injuries and 81 percent of patients with deep dermal burns. Early treatment is important for the best outcomes with burned hands. If there is any question of degree or severity, refer hand burns to a burn center or specialist. The article discusses each of these malformations individually along with their management and reconstructive options. This article is worth your time to read and reread. Dr. Charles, The Examining Room, ask me to remind you of the Charles Poetry Contest. It seems the “science hordes” have actively submitted poems while the medical folk have not. You have until September 31st to get your poems in. and they are running down the wall above Sarah’s hand …………. Go read the rest of this poem and check out the other ones. Paul Levy, Not Running a Hospital, asks a seeming simple question “What would you do?" which garnered many thoughtful comments. If you haven’t read it, please, do and the comments too. She didn’t look well. No one “looks well” sitting in an crowded ER, but she really didn’t look good. At first glance from across the room I assumed her to be fairly old, how old I wasn’t sure. Scrawled atop her clipboard in red Sharpie was ADMIT TO MEDICINE. I pulled the board and walked over to her. ………. in quite a few of the cultures in south africa people tie ribbons, strings and tassels around their own and their children's wrists and waists. these tassels are imbibed with power to keep evil spirits at bay, i am told. if these tassels come off then the patient is completely unprotected from any and all marauding evil spirits that may be lurking around. of course, not wanting to be responsible for the unopposed assault by multiple evil spirits, most people are fairly reticent to remove these things. i saw it slightly differently. …..
Henry Stern, InsureBlog, introduces a patient on the lookout for a "Competitive Oncology." ……….So what is she looking for? Well, obviously that they "connect" on a personal level, but then she said "I want a doctor who's competitive." When I asked what that meant, her answer stunned and delighted me: …………. Go read Henry’s post to find out the answer. I loved it! Although the name on the chart was oddly familiar I couldn't place her. I was covering for a partner who was on vacation. It felt like my day would never end. When she bopped into the office I knew immediately. We went to school together. Years ago. She sat down quietly on the exam table typing away on her mobile phone. I approached cautiously my mind musing on occupational hazards. I wondered if she would recognize me. ………. I was assigned a patient one very early Monday morning. He had arrived at the hospital with increasing shortness of breath, and upon further investigation it turned out that he had pericardial effusion. In the time leading up to the surgery, pericardial window with drainage of the effusion, …..
………I read it, again. There was a churn, from within. Sometimes it helps to remember the basics—the bottom line, the real meaning, the forest, not the trees or the CPT codes, or the…(many) negative things that draw our hearts, our minds, and our souls from the basics. …………. Relaxing into the evening. Sitting on the couch. Reading news and checking email. Surrounded by family. My 6yo daughter excitedly asks me something about smurfs and mermaids. I snap. None of us want to take the stresses and anxiety from the work place home. Go check out his tips. I was at work as a Charge Nurse in the Department of Emergency and Ambulatory Paediatrics aka 'Children's Casualty' , (Area 161) in the Johannesburg Hospital . The car drifted by the ambulance entrance. The glow of the brake lights lit the corner of my eye. I closed my textbook. Sigh. I was hoping for downtime. There was activity in the parking lot. A group emerged, formed a circle and scooted rapidly through the pneumatic doors, right up to the nurses station. They all spoke at once. …….. I was a typical nerd as a kid. I had glasses, braces, and an asthma inhaler. ………. Kid: Hello, ma’am. I am conducting a brief survey for the Grocer’s Association. Do you have a minute to answer a quick question? Stranger: Of course. How can I help you? Kid: I was wondering if you have Sara Lee in the freezer. Stranger: Why, yes I do. Kid: Well then let her out!!! We would then bust out in laughter and hang up the phone ………………. Do you use black humor in your workplace? Do you keep it there or do you use it in public places, including Facebook and Twitter? There has been much discussion of this over the past week and Laika, Laika's MedLibLog, writes a post “about the inappropriate use of black humor by doctors (using terms like "labia-ward") at Facebook & Twitter”: Medical Black Humor, that is Neither Funny nor Appropriate. Please, go read it all. Over the last several years, as I continue to do research for various projects, I’ve read about a growing number of Medical Photography Departments that are shutting their doors or changing their focus. Private hospitals, public community-based hospitals, and even several university-based hospitals have closed their photography and media departments in recent years. Costs and hospital/departmental needs are among the top reasons, however a more reoccurring reason is the growth of technology……. ………….How would it help to have health insurance exchange boards negotiating with health insurance carriers to try to lower premiums – without addressing the root problem, which is the ever-increasing cost of healthcare? If the carriers were to agree to lower premiums, they would have to cut back on how much they spend in claims, since that’s where most of the premium dollars go (you can only trim admin costs so much). That would mean either cutting back on benefits or paying providers less money for the work they do. Neither of those options are just between the carriers and the exchange board. Cutting back on benefits directly impacts the insureds, and cutting back on reimbursements directly impacts providers. Either way, it’s not something that can be realistically “negotiated” between health insurance carriers and health insurance exchange boards. The other major players in the healthcare industry (Pharma, hospitals, doctors, device makers, etc.) have to get involved too. ………. In a study of more than 100 children on food elimination diets based on positive serum IgE immunoassay results, oral food challenges (OFCs) demonstrated that most of the foods were being unnecessarily eliminated from the diet. ……. In an earlier post I mentioned my observations of how traumatic a trip to the emergency room can be for older people, and I promised to write about the emergence of geriatric emergency department (ED) models that provide better care for older people and can be a cost savings to the hospital. ……. “My doctor can titrate my chemotherapy to the milligram but can’t tell me when I am going to die,” a friend who was struggling with his treatment for cancer complained to me a couple years ago. …. Thank you for contributing and reading. I’m not sure what the name of this pattern is called. It began (for me) as this one called “puss-in-the-corner.” Only I put a 4-patch where the center solid square should be. The quilt is machine pieced and quilted. It measures 38 in square. I gave it to a local colleague and his wife who recently had a baby girl. I’ll be your host next Tuesday, September 20th, for Grand Rounds Volume 7 Number 52. It will be my sixth time as host of this the weekly compilation of the best of the medical bloggers. I have no specific theme in mind. Submissions should be recent. Please, only submit one (your best) post per blog. Submissions are welcome until noon (CST) Monday September 19th. Send an email to me --- rlbatesmd(at)gmail(dot)com --- with Grand Rounds in the subject line. Please help me out by including your site name, site url, your post title, post url, your name and a sentence or two about why you think your submission is great. Don’t simply look for a surgeon who is board certified. Make sure they are trained to do the procedure you are having. Yes, board certification is important, but the training is more so (in my humble opinion). If you are having a breast augmentation, you don’t want a board certified maxillofacial surgeon or Ob-Gyn or neurosurgeon. You want someone trained in plastic surgery. It is a bonus if they are board certified. By the same token, if you need brain surgery you don’t want a board certified plastic surgeon you want someone trained in neurosurgery. ……….Sant Antonio is one of a soaring number of doctors who trained in other medical specialties, such as vision or obstetrics, but have branched into the more lucrative field of cosmetic surgery. Because state laws governing office-based surgeries often are lax, levels of training vary so widely that some doctors are performing cosmetic procedures after only a weekend observing other doctors. Sant Antonio himself has offered three-day liposuction training at his office for the last few years, according to interviews with doctors who have trained under him. Some dentists trained in oral surgery now do breast implants; OB/GYNs perform tummy tucks, and radiologists are doing liposuction. The results can be disastrous, according to interviews with scores of victims, plaintiffs' lawyers and plastic surgeons, and a review of lawsuits. …………. Somewhere along the line I learned to encourage women with a family history of breast cancer to begin getting mammograms at an age 10 years prior to when their mother was diagnosed and to encourage their daughters to begin getting mammograms at an age 10 years prior to when they themselves were ever diagnosed. I learned this prior to the discovery of BRCA genes. It was a trend that had been noted among women with strong family histories. The new study (see full reference below) in the journal Cancer verifies that genetic breast cancers show up earlier in the next generation – on average by 8 years. The study from MD Anderson looked 2 generations of families with the BRCA gene to assess the age at diagnosis. Using the pool of 132 BRCA-positive women with breast cancer who participated in the high-risk protocol at The University of Texas MD Anderson Cancer Center (Gen 2), 106 women could be paired with a family member in the previous generation (Gen 1) who was diagnosed with a BRCA-related cancer (either breast cancer or ovarian cancer). The median age of cancer diagnosis was 42 years (range, 28-55 years) in Gen 1 and 48 years (range, 30-72 years) in Gen 2 (P < .001). In the parametric model, the estimated change in the expected age at onset for the entire cohort was 7.9 years (P < .0001). Statistically significant earlier ages at diagnosis also were observed within subgroups of BRCA1 and BRCA2 mutations, maternal inheritance, paternal inheritance, breast cancer only, and breast cancer-identified and ovarian cancer-identified families. It is reasonable to encourage these women with significant family history of breast cancer to begin surveillance at an earlier age than the general population. Earlier age of onset of BRCA mutation-related cancers in subsequent generations; Litton JK, et al; Cancer 2011; DOI: 10.1002/cncr.26284. … Send an email to Nick Genes (you can find his contact info at blogborygmi.com) and request to be considered as a future host. Include a link to your blog. Host bloggers must have been blogging regularly for at least 6 months, have a health theme, demonstrate good writing skills, professionalism, and respect for scientific medicine. If your blog meets those requirements (and is approved by Nick or Val) they’ll contact you via email to schedule your host date. If you missed last week’s edition, then check it out. Dr. Rich, Covert Rationing, was the host. You can read last week’s edition here. "Welcome to BA Cardiology Associates, young doctor, we're thrilled you've decided to join us. As you recall, we guarantee your salary for the first several years then when you're practice is established, your salary will be proportional to your productivity. Oh, and if you need anything, just let us know." "I had the most amazing case today! His heart rate was so slow..."
"Doctor, we're impressed at how things are going." Welcome to the September, 2011 edition of Change of Shift! This is quite the eclectic selection of posts from across the nursing blogosphere, composed of those submitted for inclusion and those I found in my travels through the neighborhood. Remember, submissions are always accepted for Change of Shift, there is never a deadline to meet, so don’t hesitate to submit a post at any time. H/T to @scanman for retweeting this “@JenniferAdaeze: I helped found a Journal of #NarrativeMedicine theintima.org follow @the_intima & spread the word :) #meded”. Not many men belong to a stitching group, but Tony Casdagli picked up his enthusiasm for the craft from his father, who kept himself sane by fashioning subversive messages as a PoW …………. The past few weeks have been filled with writing letters to organizations and patients to announce the closing of my medical practice, sorting through 21 years of stuff and deciding what to do with it (keep, give away, sell, donate), canceling accounts (Pitney Bowes, credit card processing, yellow page ads, etc), trying to sublease the office space (as I am caught midway in my lease), getting a PO Box so journals, etc don’t come directly to my home (as we all know our data is sold to marketing), and copying records as the requests come in. Much of this has been a review of my past 21 years. I seem to have used my office (and the draws, filing cabinet space) to store not just professional correspondence, but also personal. I had a couple of drawers that I routinely keep filled with cards (birthday, thank you, condolence, encouragement, just because). I love mailing cards to family and friends. My desk was a nice space to sit down and do this before the day began. I have been amazed at the number of letters I have “squirreled” away in my desk drawers. Many of these are from loved ones now dead (my mother, my old high school math teacher, a plastic surgery mentor). Others are thank you notes from nieces and nephews who had just learned to write. These made me smile, as they are now in high school, college, or grown with their own children. Coping the charts bring many emotions. I did the right thing here. Did I miss something here? What if I had done this one differently? If I did this one today I would do it like this, not like that? I would do this one the very same way. I wonder how this one is doing. So many emotions in reviewing the past 21 years. Updated 3/2017-- photos and all links removed removed as many no longer active. I was invited to attend this event (photo credit) by Scarlett (Quilting editor) who is one of the four local employees of this Australia-based network. The other three are Denise (needlework editor), Stacie (Jewelry Making editor) and Anne (Sewing editor). It was sponsored by CraftGossip.com and EKSuccess. After having a great lunch (food by Trio’s), we were split from our original tables. The new groups then decorated hats together. My group didn’t win, but I liked ours. Seen here, modeled by Suzanne who blogs at UnRuffled (sorry I can’t a link to her blog). She is a newly graduated respiratory therapist. Then we were asked to try out this craft kit. The kit includes the needle and thread as well as the die-cut fabric pieces needed to create the bows. You then have a choice of it being a barrette or a pin. The hardware is included for each. It was amazing the goodies we were given to take home. Not much in the way of fabric or yarn (my favorite mediums), but I love the acid-free pens and the scissors! Here are some of the things I did bring home (I gave twice as much to a woman who puts craft kits together for the cystic fibrosis patients at Arkansas Children’s Hospital. I wish I had given her all of my stuff (well, not the pens and scissors). This bead kits look wonderful for kids (which I don’t have). I think Methodical Madness’ will like them. These stickers would be great for a scrap booker or maybe my teenage niece will like them. These kits would be great fun to do with kids. I did find some possible quilt inspiration in thumbing through the beading booklet. This small quilt (9 in X 10.5 in) began as a needlepoint project back in 1993 from a kit I bought on a trip to San Francisco. 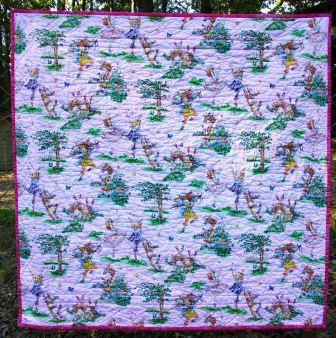 The kit is a DeDe’s needlework design (Dede Ogden). It is her Gold Rush S.F. 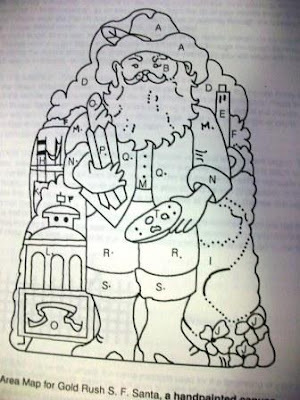 Santa. 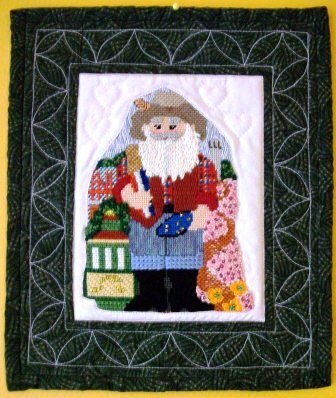 I had long ago finished the Santa, but for some reason did not do the background and then misplaced or lost the thread needed for the background. When I “stumbled” upon it again recently, I decided to turn it into a small quilt. I added a white fabric background and then a border. 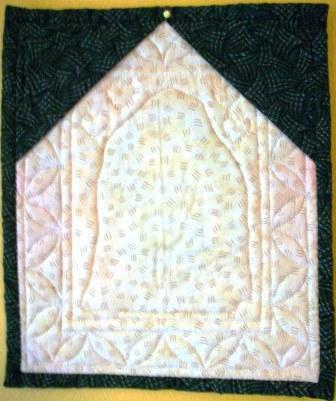 I then machine and hand quilted it. The back has triangles to add in hanging the quilt. A small bamboo stick can be placed and hung on a picture hook (see where the pin is). Here is the Gold Rush S.F. Santa design which makes it a little easier to appreciate the San Francisco elements included. There’s the pan of gold Santa is holding in his left hand, the sourdough bread in his right. Just off his right elbow is the Golden Gate bridge and below that the cable car. The “E” area is the Coit Tower. The “I” area is the Crooked Street. The “J” flowers are poppies. 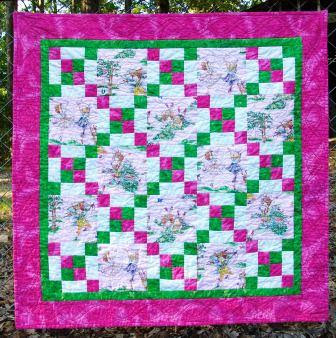 I sent this quilt to our fellow blogger Doc Gurley. Many women with large breast and weight issues seek breast reduction. I was taught to encourage them to lose weight first. Now there is a very small study that backs this up (full reference below). The American Society of Plastic Surgeons issued a press release entitled “Breast Reduction and Bariatric Surgery—Which Should Be Done First?” and provided the answer “ Final Results May Be Better When Weight Loss Comes First.” I agree, but find it odd that such a small study was published. There should have been more patients included. Jeffrey A. Gusenoff, MD, and colleagues reviewed two groups of patients who sought consultation for body contouring surgery August of 2008 and February of 2010 after massive weight loss (defined as a weight loss of greater than 50 pounds). Group I (n=15) included any patients who underwent reduction mammoplasty for symptomatic macromastia before massive weight loss. Group II (the control group, n=14) included any patients who did not undergo breast surgery before massive weight loss. The patients were given a prospective phone survey to assess self-ratings of breast appearance before and after breast reduction and after massive weight loss, ability to exercise, which would have preferred to have first—massive weight loss or breast reduction surgery—and what they would recommend to a friend. Of the 15 patients (7.9%) in group I, 14 completed the survey (93%). For group I, all patients felt the appearance of their breasts improved after reduction (p < 0.001) but felt appearance worsened or stayed the same after weight loss (p = 0.003). Seventy-one percent of patients were able to exercise more and 64 percent were able to lose weight on their own because of their reduction. ……..
All 14 patients (100 percent) would recommend losing weight before undergoing breast surgery. Even though I tend to agree that patients should loss weight prior to breast surgery. It is much easier to achieve the cosmetic goals of the patient if she is at or near her goal weight. Otherwise, the surgeon and patient are left to guess at how her skin will retract with weight loss and how much deflation or loss of volume will occur. I wish the study had ask how many of the Group I patients desired an augmentation as part of their revision. Eleven patients (79 percent) felt a secondary lift following massive weight loss should be covered by insurance, and seven patients (50 percent) plan on having revision breast surgery. Eleven patients (79 percent) wished their breasts currently appeared different, with eight (57 percent) desiring lifted breasts, seven (50 percent) desiring general reshaping, two (14 percent) desiring reduced breasts, and two (14 percent) desiring larger breasts. I have augmented four patients over my 21 years of practice who had previous breast reductions prior to losing weight (one was mine). This should be included in the discussion as well as the high probability that a revision to reshape or re-lift the breasts will be needed if the reduction is done prior to the (massive) weight loss. Dr. Rich, Covert Rationing, is the host for this week’s Grand Rounds. You can read this week’s edition here. While Grand Rounds is normally the highlight of everybody’s week here in the medical blogosphere, this time it’s different. ………….. But be assured that there is good stuff to follow. So, if you find yourself incapable of focusing your attention on Grand Rounds at the moment, simply bookmark this page, and return to it once your sense of soaring happiness returns (as it inevitably must) to a more normal state. Be assured that this week’s entries are timeless enough to outlive your ecstasy (an emotion which – alas! – to be effective, must always be transient). I wrote the chapter on contraception, but it’s just a teeny-tiny piece of this amazingly comprehensive text, available either in hardcopy or as an e-book from the AAP Bookstore. The site looks like it would be very helpful in keeping track of medical expenses, especially from multiple sources (doctors, hospitals, labs, etc). I plan to bookmark it and look at it closer. It sounds like something out of an Edgar Allen Poe tale of horror. A man becomes agitated by strange sounds only to find that they are emanating from inside his own body—his heart, his pulse, the very movement of his eyes in their sockets. Yet superior canal dehiscence syndrome (SCDS) is a very real affliction caused by a small hole in the bone covering part of the inner ear. Such a breach results in distortion of hearing and, often, impaired balance. ……………. 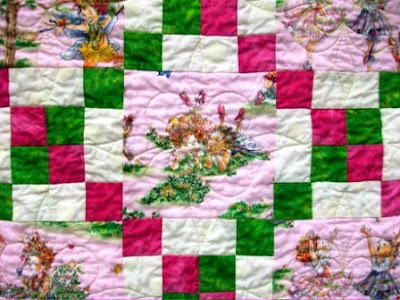 I wonder how many of us started quilting with Quilt in a Day quilts by Eleanor Burns. I know I made about 8 quilts from her Double Irish Chain book before feeling confident enough to try other patterns. (I happened to get on an elevator with her at Spring Quilt Market, and thanked her profusely for her inspiration during my quilting beginnings--she probably thought I was crazy; I kept going on and on about all the quilts I made from her patterns those first couple of years)! Anyway, because of procrastination I needed to make a baby quilt in a day. And I had just a jelly roll and yardage for backing. …………. It’s amazing what you will find sorting through more than 20 years of stuff. 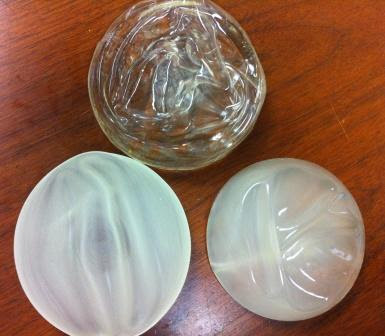 This picture of 3 implants includes: top -- an old McGhan double lumen (silicone gel implant surrounded by a saline implant); bottom left – Dow Corning textured silicone implant; and bottom right – Dow Corning smooth silicone implant. Dow Corning has not made breast implants since approximately 1992. Last week the FDA met to discuss and make recommendations on postmarketing issues related to silicone gel-filled breast implants. As a condition of placing silicone implants back on the market in 2006, both Mentor and Allergan (McGhan) were suppose to enroll patients in 10-year-long follow up studies on side effects related to implants. The aim was for 80,000 women. After two years, about 60 percent of Allergan patients were still participating, but just 21 percent of Mentor patients were involved. I, like Dr Rob Oliver (Plastic Surgery 101 Blog), found the requirement of routine MRI screening at three years after getting implants and every two years following to look for silent ruptures to be unrealistic and unnecessary. Insurance often did not cover this expense to the patient. The FDA has now removed this requirement. Several advisory panel members said the FDA's requirement that women have frequent MRIs to make sure the implants haven't ruptured is unrealistic and should be removed from the product label. Insurance usually doesn't pay for the scans, so most women don't get them done. But it's the only way to find out whether the implant has ruptured in the absence of symptoms. The advisory panel did recommend the creation of a nationwide database to follow women who have had silicone-gel breast implants for at least a decade after they had the surgery. I think it should be for 20 years. 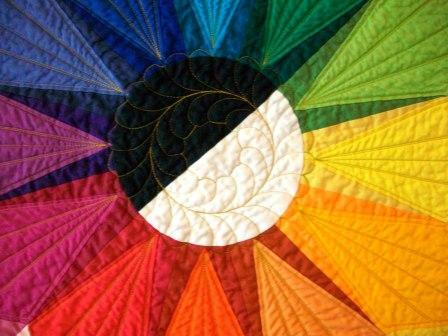 I finally finished the color wheel wall hanging quilt! 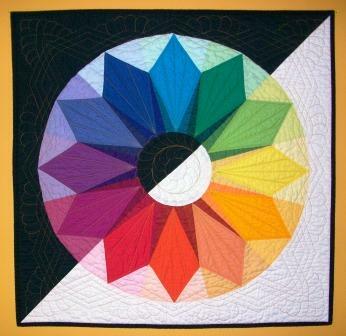 As you may recall, it is from a 1993 color wheel kit designed by Susan McKelvy (author of Color for Quilters). I began the quilt earlier this summer and finished it a few weeks ago. 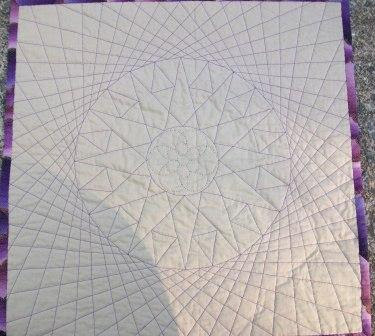 It is machine and hand pieced. It is machine quilted. It is 29 in square in size. Here is a closer photo to show the quilting better. 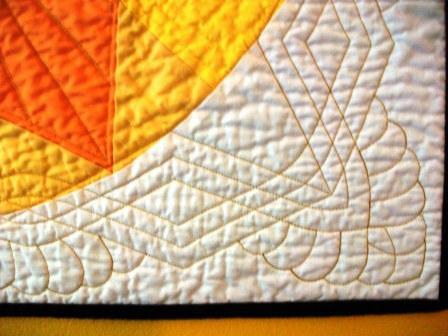 Here you can see the quilting of the border. The back is a black cotton. I tried to get a good photo of the quilting from the back, but it didn’t work out. I can’t say I am a fan of boxing, but I can appreciate the discipline required both mentally and physically. The American Academy of Pediatrics has recently (full reference below, free access) issued a policy statement on participation of children and adolescents in the sport of boxing (bold emphasis is mine). I would tend to agree that children should be encouraged to participate in sports that have less risk of concussion injury.